When disposing of waste, it is important for yourselves, the environment and your local area that it is done correctly and considerately. When choosing your skip hire company, you should always do your research to see if the business operates their own licensed waste transfer stations (regulated by the Environment Agency – like Dial a Bin does). Licensed companies will also have a waste carrier’s license, which you are allowed to ask to see so that you have evidence that they aren’t a ‘cowboy company’. 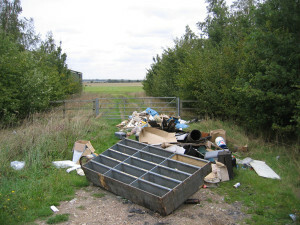 Many companies that dispose of waste illegally usually operate for much cheaper prices than licensed waste carriers – therefore increasing the number of fly-tippers because they cannot afford to dispose of the waste properly. The cheaper waste disposal organisations are usually the ones that don’t do the job properly. The collection and ethical disposal of waste is more expensive than you’d imagine – from landfill tax to recycling costs, fuel and public liability insurance. At Dial a Bin, our skip hire, and waste disposal rates reflect these costs and the legitimacy of our functionality. Did you know that if your skip hire company dispose of your waste illegally, i.e. fly tipping, then you can get charged for it? Not only does it increase your council tax bill (as the council has to clear up after them) but you will be the one to blame for not making sure that you hired licensed waste carriers, and will most likely end up with a fine to pay. What Happens To The Waste We Collect? There are companies out there that don’t fly-tip your waste but pay the tax to empty it into an already overcrowded landfill. Would you rather hire a skip hire company that is happy to just throw all of your waste into a landfill site, causing more damage to the environment year on year? Or would you like to hire a skip hire company that takes pride in sifting through the waste to recycle as much as physically possible? We know which we’d prefer and that is exactly what our team at Dial a Bin do. Every skip or wheelie bin that we collect and return to our depot receives a thorough search, separating the reusable and recyclable items from what actually needs to go to landfill. To speak with our team in detail about the services that we provide, including our commercial and domestic recycling solutions, please get in touch on 01280 875 620.